Singapore, 19 November 2018 – The Asia Pacific Predator League 2019 returns for the second year, growing significantly in scale and ambition. Expanding from its inaugural edition of 8 participating countries with DOTA2, the Asia Pacific Predator League 2019 will see participation from 16 countries and host regional tournaments for PlayerUnknown’s Battlegrounds (PUBG) and DOTA2 tournaments. The total prize money has also grown a grand total of USD400,000 including local prizes across the 16 countries in this edition. The Asia Pacific Predator League 2019 follows the successful organisation of the first Asia Pacific Predator League which culminated in a nail-biting DOTA2 finals in Jakarta, in January this year, which was won by Geek Fam from Malaysia. In that championship, a total of 1197 teams registered and 8 teams from 8 countries competed to be crowned the best DOTA 2 players. Asia Pacific Predator League 2018 was widely followed and saw 3million campaign engagements, 321million campaign reach and ranked No. 1 popularity on Instagram among the final match with the #APACPredatorLeague hastag. These positive feedbacks reflected the tremendous potential of the eSports industry and continues to fuel the Predator brand’s dedication to gaming at its most competitive levels. Mr. Andrew Hou, President of Pan Asia Pacific, states: “Esports will become a key element of the country’s ecosystem, thereby laying groundwork for further growth of the digital economy.” The Predator brand is proud to provide eSports players with innovative hardware ranging from gaming notebooks and desktops to top-notch displays and accessories, as well as offer the gaming community an opportunity to live their eSports dream with the Asia Pacific Predator League tournament. 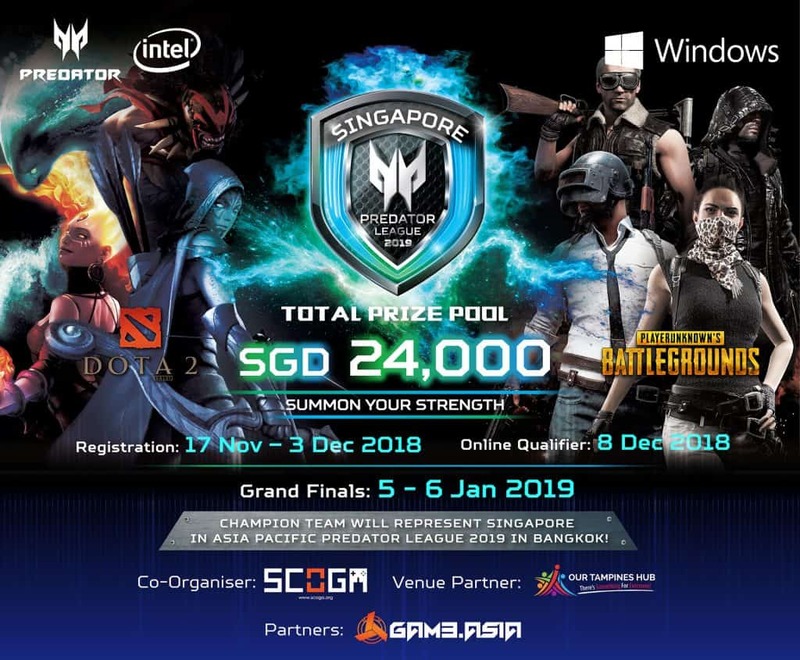 The Singapore Predator League 2019 tournament will feature both the DOTA2 and PUBG games with a total prize pool of SGD 24,000 worth of cash and prizes. Gaming enthusiasts can register online now at https://www.predator-league.com/regionrules?region=SG. Registration closes on 3 December and online qualifiers will be on 8 December. The qualifiers will meet for the Singapore Grand Finals in One Tampines Hub on 5 and 6 January 2019. The winning teams of the Singapore Predator League 2019 Grand Finals teams will represent the nation for the Asia Pacific Predator League 2019. Acer is pleased to partner the Singapore Cybersports & Online Gaming Association (SCOGA) and GameAsia for the on-ground activation for the Singapore Predator League 2019. The winners of the Singapore Predator League 2019 Grand Finals will undergo physical and mental condition under the Esports Academy in preparation for the regional finals. The Asia Pacific Predator League 2019 will be held on 15-17 February 2019 at the Nimibutr Stadium, which is located in the National Stadium complex, Bangkok, Thailand. A throng of eSports players from the participating countries in the Asia Pacific region – Taiwan, Korea, Malaysia, Thailand, Philippines, Indonesia, Vietnam, Japan, Singapore, Australia, India, China, Macau, Hong Kong, Myanmar and Sri Lanka, are expected to converge in Bangkok to show off their skills in February 2019. Established in 1976, Acer is a hardware, software and services corporation dedicated to research, design, sale and marketing, and supports of products that help improve quality of life. Our product offerings include PC, monitor, projector, server, tablet, smartphone and wearable. In addition, we also develop cloud solutions to accommodate the internet of things technology. In 2016 Acer just celebrated its 40th anniversary. As one of the world’s leading computer companies, we employ 7,000 people worldwide and have presence in more than 160 countries. Learn more about Acer at www.acer.com.